Dow Honda | Warranty and Accessories | Up to $100 in Winter Tire Rebates! Up to $100 in Winter Tire Rebates! Winter is on its way! Is your Honda ready? Winter tires are one of the best ways to prepare for the winter roads, and our tire rebates make it easy! 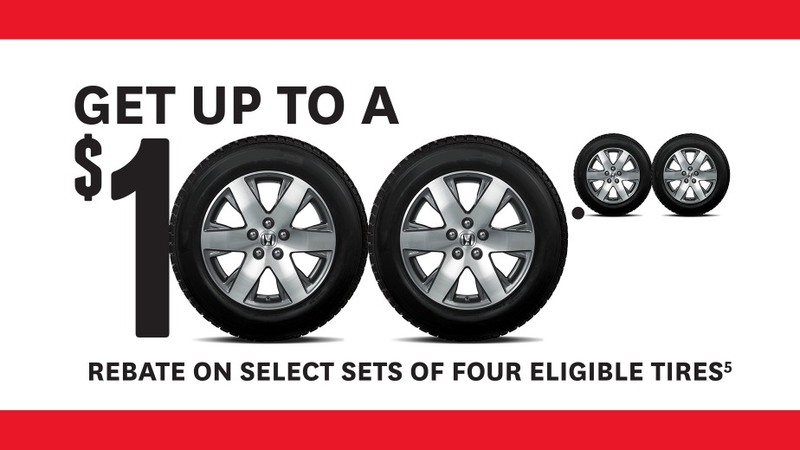 When you purchase a set of four eligible winter tires at Dow Honda, you can get up to $100.00 in rebates! From October 1 to December 31, 2017 receive up to $100.00 on eligible Goodyear winter tires! From October 1 to December 31, 2017 receive up to $60.00 on eligible Dunlop winter tires! From September 15 to December 15, 2017 receive up to $70.00 on eligible Yokohama winter tires! From October 1 to December 15, 2017 receive up to $100.00 on eligible Pirelli winter tires! From October 15 to December 15, 2017 receive up to $65.00 on eligible Continental winter tires! From October 15 to December 15, 2017 receive up to $35.00 on eligible General Tire winter tires! From October 15 to December 15, 2017 receive up to $100.00 on eligible Hanook winter tires! From October 13 to December 15, 2017 Receive up to $70.00 on eligible Michelin winter tires! From October 13 to December 15, 2017 receive up to $50.00 on eligible BFGoodrich winter tires! From October 13 to December 15, 2017 receive up to $40.00 on eligible Uniroyal winter tires! From October 15 to December 15, 2017 receive up to $70.00 on eligible Bridgestone winter tires! If you have any questions about winter tires, click here to contact us! Click here to shop for tires and wheels online!